The rights of a mother to protect her children, and do what is best for them, plays a very big part in this movie. 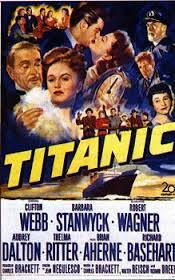 The movie Titanic came out in 1953, and starred Barbara Stanwyck, Clifton Webb, and Robert Wagner. 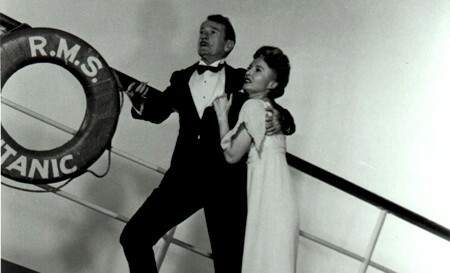 While the movie does take place aboard the Titanic¸ the story actually involves the married couple, Julia (Barbara Stanwyck) and her husband, Richard (Clifton Webb), who are not very happy in their marriage. Julia is on Titanic with her two children, Annette and Norman, and she is on the ship without her husband, who has no idea exactly what is going on and why his wife disappeared with her children. 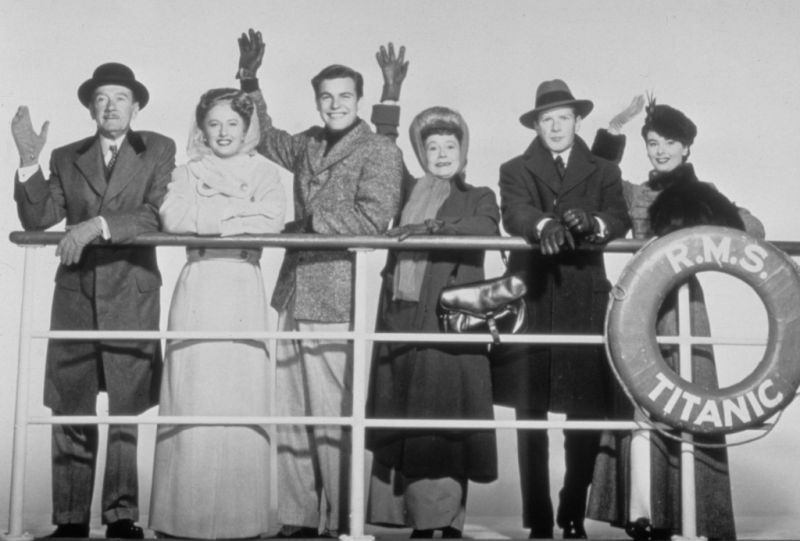 The movie is heartbreaking for more than one reason because a huge family drama takes place while the infamous ill-fated ship is sinking. The main plot of the Titanic movie is actually not about the ship itself, but about a woman who is trying to do what she feels is best for her children. The Sturges family has been living in Europe for a long time, and now Julia has decided that living overseas for so long has really had a negative effect on her children. Julia is from Michigan, and feels that now is the time for her children to return to America, where they will have a more normal life. Annette is 17 years old, and in the words of her mother, “she is an arrogant little prig.” Annette wears the finest clothing, eats only the best food, and is quite used to having dinner with people that are high in society. The first scene with them on the Titanic shows Julia, Annette, and Norman at dinner, and Annette is unhappy with their choice of tables because, “it’s a really bad table, there’s not a person we know at this end of the room.” It is clear to see from Annette’s behavior that Julia is right, and the teenage girl could use some humility and a less luxurious lifestyle. As for Norman, Julia wants him to learn about a normal life and learn how to be a normal child where he will actually get to walk to school every day. When Richard does reunite with his family, it is a happy occasion for his children, but not so happy for his wife, who tries to be gracious, but it is clear she is not thrilled to see her husband has made it onto the ship. Richard and Julia are having words about her decision to take the children to Michigan, and it is clear from his behavior and attitude that he could use some humility as well. Richard criticizes his wife because “20 years ago I made the unpardonable error of thinking I could civilize a girl who bought her hats out of a Sears & Roebuck catalog.” Clearly from his sharp words, Richard has disdain for his wife because he is trying to help her children, but he also enjoys rubbing his high class status in her face. When it comes time to tell Annette about her mother’s plans, Richard does his best to break the news in the worst possible way, which is by telling her that she has missed out on a very fancy luncheon where she would have had the chance to meet up with a few eligible bachelors. Julia does not want to see her daughter in a loveless marriage, but thanks to her father’s aristocratic influence, Annette intends to return to Europe no matter what her mother wants. However, there is one bright light of hope, Robert Wagner plays a young college man who has taken an interest in Annette and goes to work on melting the icy exterior she displays to him every chance she gets. As the movie progresses, Richard and Julia are still bickering about her decision to go to Michigan, and Richard does his best to insult and humiliate her. Julia realizes that Annette is a lost cause, but she is very insistent that Norman stay with her in America. Naturally, Richard wants his son, and tells Julia that she will not keep them apart because that is his son. However, Julia breaks the news to him that Norman is not his son, but the result of a one night stand she had after being humiliated at a party she had attended with Richard. Richard does not react well to this news, and tells Julia that he will have nothing further to do with Norman, and that the boy is hers to do with as she pleases. 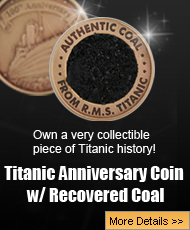 When the Titanic and iceberg meet, everything changes, and suddenly all the character flaws that both Julia and Richard hated about one another is gone when Richard helps his family get into a lifeboat. Even the disdain Richard feels toward Norman is gone as he tries to keep them all calm and get them off of the sinking ship. Norman loves his father very much, and does not want to leave him behind. When the chance comes, Norman leaves the lifeboat, gives his seat to a woman, and goes to be with his father. When Julia discovers her son is not on the lifeboat, she breaks down crying as she glances out toward the sinking ship.